The art of listening is an intricate one. Does one listen to the constant nagging of a spouse? Recorded at 33rpm but played a 100 times over and over again? If you are married and live under the same roof you have to. My primary school teacher used to teach us students in class by saying that we listen but do not hear! She is correct as one can drone on and drone assuming the other party is listening and hearing. Sadly, the latter is never true. I have given up listening and hearing. I refuse to listen and hear given the same is not reciprocated. Further, it is tiring to pretend to listen and so I literally tell parties to shut up and walk away. Rude? Probably – but I needed to protect my own sanity. Sanity is fragile at this stage of my life. I have too many balls juggled into the air that I must make a conscientious decision to shut out and stop taking more balls as there is just so much that my two tiny hands can juggle at any one time. I wish I could practise obvious disregard. I have been unable to do just this, unlike my siblings who excel in it. I wish I had their nonchalance and disregard for the rest of the world that does not encroach onto their precious lives. My siblings are able to switch off to things they choose to ignore. Cold and callous but I envy them, as with it, they have decided what fits into their life and what does not. Selfish but smart. I am in a quandary – call it mid life crisis for the 10th time. Each time I have overcome. Each time I have made huge sacrifices. Perhaps it is time for me to stop making sacrifices for others and think of myself just once. I am tired of being the strong one. I am even more fed up as being branded and stereo typed as “oh she is strong, she will overcome” – it seems no one cares other than to let me sort out the problems others bring to me. I had spent the last week taking stock of my achievements in life. Not a whole lot. A lot more is felt in the pain and suffering I went through. Literally, physical pain and suffering besides psychological pain and trauma. I marvelled at how I could pick self off the ground to start living after being ejected from a house I thought was home. It is hard to be the black sheep of the family – not because I was a tyrant but I was politically ousted. I struggled in those days, keeping two jobs before heading home to a simple meal and to start the next day again. I guess my body is protesting now as the hardship I went through is finally taking its toll on my body. I remember working 2 full shifts at work before ending the weekend with assignment jobs. It was tough and I successfully managed to put a roof over my head and food on the table. During this while, my one parent and 2 siblings forgot my existence. No one offered me a helping hand other than my mother whom I was told had to put up with the political fights at home as she sneaked out to visit me. How do I begin to forgive this parent and siblings? I continued on to be a sibling on call if needed. Perhaps to these selfish beings, I am their “person” to sought out if they need help. I continue to pay the bills of these two siblings – will generosity and kindness overcome their hearts to be a sibling to me? I do not know and will not want to go down that path. I do not remember a thank you for paying their bills or an inkling to say “hey I will pay your back”- it silently became my portfolio of cost. Being giving, makes me a fool I think. Like Beng, he too is the one who gives to his siblings. In a way, I am akin to him. But sometimes giving takes its toll. I have hardened against my views on life. I will still continue to give my best but this time, I know that whatever I give, falls into an abyss. My siblings are not an impoverished lot. It is about choices and how they choose to spend. One can always moan there are insufficient funds. But if they choose to allot their funds for their own use and not considering the needs of others, then are they poor or selfish? Does poverty make them more discerning in their expenses? Or lifestyle changes? I do not see this. I find it hard to feel that I have a family. Perhaps in name or as in a label. I suppose my youngest sibling would be trying as I was grateful for his help when I was ill. My intent was not for him to care for me but more so to ensure my parents were not inconvenienced. Fact is, once I was discharged, he left. I felt that I would need help most after discharge but sadly that is the time he chose to leave. Thankfully I had the support of strangers who took me for my follow up doctors’ appointments. Did he listen? Did he hear? He listened but did not hear. I suppose it can be said that who asked me to be ill? It is not in their schedule to fit into my illness. Yes, I am to blame and not they. Strangers seem better than family – I seem to feel that. Strangers offer care and assistance when in need. Not my family. So what is a family? Not a whole lot. Is this the failure of my parents to create a nurturing and caring environment? I believe it is the failure of my father. He chose to be politically motivated by the other two children and chose to make my life difficult. Well, he has succeeded but I am around for concluding my role as a child. Such is the dichotomy of life. I will never be a parent much less a spouse. I doubt I can ever be a good spouse as spouse like qualities I see in my parents are not something I wish to emulate. As for children, they are a bane to earth. If I ever bring forth selfish children or children who create a living hell for their siblings, would that be a fair choice? I am cynical. I am despondent. I am truly fed up. I have so much anger and animosity for the people who drive me to this state of mind. I do not believe in friendships or family. Still I will do the needful to fulfil my role and move on. My biggest enemies are the people whom I cared for the most. Only my enemies whom I cared for the most will kill me in one fell swoop! A large part of my life went through hardships and solitude. During those horrid years, Beng came into my life. Though Beng did not show self to be wealthy, he shared whatever he had with me. I laughed. I cried. I quarrelled. I fought. I did all these with Beng as he showed me Singapore. Beng never looked down on me. Unlike my siblings, Beng seemed to care. I saw Beng almost daily. Each time we met, we had heaps of laughter. We found solace in each other’s comfort. He sought me to escape his worries. We spoke. We confided. But at the end of 26 years, Beng disappeared. I do not know if this void of bantering or laughter can ever be filled. Beng always said that if I called, he will be there. Beng is never ever to appear before me. He can’t. He is dead. Will Beng live on in my memories? I suppose so as there are so many things that remind me of Beng. Sadly, Beng once told me he would grow old with me. Can I survive the loss of Beng? Will the sound of his Beng laughter be replaceable? Beng was around whenever I was down or felt in need of a bout of cheer. I am still reeling from his loss. My burden is heavy and Beng is not around to lighten my load or comfort me as to why siblings are not truly my siblings. For years, I grew up without sibling care. I had only sadness and hurt from my siblings. Perhaps one day my siblings will turn around and miss me and say sorry for making my growing up years miserable. I bought this in one of the retail shops at Novena City. Korean Soap that come in dvds have greatly permeated the lives of Singaporeans. I am but one who is hooked in it. Though I have not much time to spend in a day to watch such soaps, I manage to plough through 15-20 discs after a few months. The food of Koreans are yummy. I tried this ramen in two ways. One with just shitake mushrooms and onions with seaweed. The other with mince pork, golden needle mushrooms & shitake mushrooms. Both turned out well. Portions are huge and for me a packet serves two portions. You got to try it to appreciate a bit of Korean. 3 weeks ago I had “bimbup” (probably spelt wrongly) rice with my sister. It is $8.80 per pax buffet style. My first taste of it. Healthy and yummy! I am somebody’s child. The wrongs done to me hurts as it would hurt you too, unless of course you are an android. Like you, I am made of tissue, cells and have blood coursing through veins. No different. Orwell said some are more equal than others. I suppose so and you see self as more equal than I.
I have given my help always. In circumstances where I could not help financially, I am sure I am deemed unhelpful by you. Spouting biblical phrases does not gel with your actions. You have judged me as I have judged you. Where you have judged, you meted out a life sentence to me. Wealth matters. You reminded me often enough. It mattered to you because I did not matter to you. For those whose wealth did not matter to you, you gave as you consumed. The world is a smaller place but yet you successfully made it a great divide. I am a pawn. I am used when of use and as a resource of future use, kept like a prostitute. Expensable, beckon when called, shelved when not required. I am expressedly tired of being useful. Will I be of use to you in the future? Perhaps ties would hold me from refraining help. But I am carefully reviewing my thoughts. If I die, you would rejoice as I no longer am a thorn, reminding you of what you did or did not wish to do. You are then absolved of your promises and can be unshackled of me. Was I stupid to believe in the ties that bound us? YES. Will I see light of day? NO. I am of no economic use. I have no useful contacts as land migration of business models prevail. Education is a mere phase. Spouting theories to confound your audience in hope of wowing will work sometimes. Not all times! My dear sweet Enemy has won. I concede defeat. My life lay in ruins before you, at your feet. Rejoice my dear Enemy….you won in the end! Having been to 12 golf tournaments organised by different organizations in different categories of business, I can see the difference in cultural settings, tone and positioning of the event. Usually graced by important dignitaries of state, such events would be held in dignified tones with the emcee behaving rather constrained to ensure no embarrassment to the guest of honour nor to the host. The entertainment for the evening would be muted and done in good light without lampooning anyone of sorts. Last evening’s golf tournament held by an SME was an interestingly refreshing feel in terms of experience, humour and tone. Firstly, no important guest of honor graced the event. The CEO opened the night’s revelry with his narration of the sighting of the lovely rainbow after a heavy downpour without ruining the event. He alluded to the skies being a perfect fit with his organisation’s friendly golf tournament. Food was undeniably good. 8 courses which excluded shark’s fin soup (good that the organisation respected the sharks and so, another shark did not lose its fins!). Cold dish was served with a blue lighted globe which added to the aura of manga world and had a good selection of roasted belly pork, jelly fish, fritters with squid meat laced with mayo, roasted duck and spring rolls. Next came double boiled melon soup with fish maw and lobster meat. I gave this soup a pass as crustaceans and I are not the best buddies! A shelled prawn dish served on a basket of fried bi hoon, attractively decorated with celery amidst red, green and yellow bell peppers. Another bi hoon basket held the roasted cashews! I enjoyed the basket and I led the trend in having the other diners to start breaking the basket into bits to eat. The steamed fish in soya sauce with spring onion and parsley was a let down. It was a fresh water fish and “muddy” – it looked at us fiercely. The meat was sticky and “collagen” like as it was gooey sticky – I had the stomach part. Broccoli, monkey head mushroom, sprinkled with wolfberry seeds and small shoots of golden head needle mushrooms was a happy dish for veggie lovers like me. Satiated, I ate no more and gave the roasted chicken ( I cannot eat this either) served with prawn crackers and remaining dishes a pass. Fried Yee Fu noodles and mango pudding dessert. Suzie Wong was cool. I had bumped into her whilst parking my car and she was dragging her luggage. Little did I know that this little lady packed a whallop in singing voice, pole dancing and moves. She peppered her emcee role with heavy usage of Hokkien dialect and did seductive pole dancing to keep the gents happy. The ballroom was resounding in the background with chants of “hhhhuuuaat ahh” – it reminded me of a 7th month event where auctions are held for the year or a Chinese wedding dinner as the organisers went around the tables with their whisky glasses to clink glasses and thank diners for their presence. It has been a long while since I went to an oriental sit down dinner which had hues of 7th month festivities, wedding dinner flavours and a corporate event – 3 in 1, fairly well done in a unique style of the organisation! Not all golf events can be stuffy and refined. Some can be seemingly crass yet delivering the fun across to suit the audience’s taste and preferences. It is not one size fits all and credit must go to Suzie Wong who delivered the night’s event with style appreciated by the audience. It gave loads of hilarious bellows as men were made to go on stage and perform pole dancing! Suzie Wong may be a pint size lady but she had strong muscles to do acrobatic moves on the pole! Great job to the organisers and Suzie Wong for a delightfully different evening! It is not that I ran out of ideas or think thoughts to write today. But it is the fury of my colleague S Man’s that prompted me to write this. S Man has been threatening his resignation for the last 3 months. To date, he has yet to submit his resignation letter. He claims that on 1st October 2013, his letter of resignation would be given to his Line Manager. Between the time he started his winds of change, the entire business fraternity got wind of his impending departure from the firm. His Line Manager is rather patient as business associates would ask him to confirm the “rumour”. No action has been taken against S Man although he is in a senior position. S Man has been wiling away his time, doing his Houdini acts and not coming in to work on time. He has been taking it easy for some 3 months now. So, when at the regular heads of department meeting he was ragged by his Line Manager, he stormed into my room for some therapy. In S Man’s view the shift in time line for his work was something unbearable. All I could do was give him a listening ear! I had enough problems of my own and to mess with his, was not my option to pursue. My therapy lasted 10 minutes and I sent him on his merry way. My take on it – if you take salary from a company, the onus lies on the employee to deliver work expected. It is incorrect to skive or wile away time when others are working for their keep. Further, as professional etiquette, one does not bad mouth the hand that feeds you. Perhaps I am antiquated in business practice or work ethics – but I maintain my personal stand. For me, I have accepted that at work, I toe party line and deliver the objectives expected of me – no more, no less. Each month, I will check my salary to ensure not a penny less or a penny more. I am satisfied. This is my role as an employee and my place in the office. We are counting down to 1st October 2013…only then will we know S Man’s intent on the job front. Forgiveness Is Hard – Where Do I Begin? Over the years of life, many people, including family or “friends” have done me a lot of awful things. Each time, I bite my tongue and put my head down, striving for the next level. Family or otherwise, it is just a label, just like “friends”. When I was younger, reading quotable quotes gave me courage to plod on. But over the years, motivational phrases do not mean much. It is just words. The most horrible man I ever knew would always spout forgiveness as a virtue but he continuously hurt others and claim to “forgive” others. All a fallacy I quip! Labels of relationship statuses do not mean much these days. Labels such as marriages, sisters, brothers, friends are meaningless. What is the base that holds on to people? Sadly, I have found it to be the huge letter “S” alphabet with 2 vertical lines running through it that gives the dollar symbol “$”. Money makes the world go round. Without money, there is no happiness. Happiness is transient and agreeably, $ gives a transient happiness feel. What surrounds relationships? Unfortunately it is money. Money breaks up families or harmonises families. When one dies, the beneficiaries would tussle over inheritance. I have seen the ugly and I continue to hear the ugly for such matters. The greed for wealth is real. When is a sum ever enough? A man may choose to commit to a property that he can ill afford. For what reasons? To prove to a mutual acquaintance that he is no lesser off in wealth than him perhaps? It would seem to boil down to a case of inferiority complex isn’t it? Why can one not be happy in their own skin per se? I cite my own experience. For my growing up years, I refuse to conform to the norm of being dressed in designer togs. I was comfortable in my humble t-shirt and jeans. My siblings looked down on me and ostracised me from their world. I was shunned like a leper on the streets if we met and they in their mutual comfort zone. I walked on. I did not need a sibling to tell me who I was. I continued on in life. I strived to be in the top 10% income bracket of my cohort. By generic peer comparison, I was supposedly “well off”- notice I said, “supposedly”. But what is “supposedly” well off? The same horrible man I knew and I thought a label befitting “friend” or “partner” as apt failed me miserably. The $ sign was pivotal and I was seen as a $ sign – nothing more, nothing less. When I became of no significant $ use, I was changed out. How do I begin to “forgive” people? I do not. I honestly stopped trying to forgive and instead try to forget. It is also very hard to forget the awful things done to me. It is a trying experience. Working life is also full of terrible experiences. I believe in walking the ground and working with the ground to achieve objectives. Often times, political play comes heavily into the picture. It is not what you know, but evidently who you know or how fast to play ball and join the political plots of others. Highly inefficient and a waste of my previous time resource. Isn’t it? But such is the path of success one must thread to be indoctrinated into super management standards. Generally $ is everything and the only thing for office politics. It is the quest of the weaker in knowledge or management intellect to quell the successes of others. Guess what? Often times, these “political players” succeeds at the expense of others. A wise old lady once told me, “cut your coat according to your cloth”. Throughout my life, I practised frugality. I lived conservatively, saving pennies for a rainy day as I am always mindful of urgent needs of funds. I grew up poorer than the rest of my siblings as I was forced to move out of my comfort zone by political ploy of my siblings with my father. Over night, I had to grow up and survive. I had to put a roof over my head, put food on the table and earn my own keep. I did not have the luxury of a comfort zone to build my own wealth in my own time. I had to run a treadmill marathon and could not get off it. If I did, I will smash into the wall miserably. Whilst running this treadmill marathon, my beau decided to abandon me for another richer lady. In his mind, I was a poor catch – the black sheep of the family. He felt he could do better. My gain, his loss? Today this man is probably “happy”or “miserable”in his own zone of being tightly controlled by the throat where finances are concerned. Properties seemed the sure-fire way to make dollars grow. This was true till the spiralling prices forced the local government to stem loans, closed the flood gates of foreign talent and all things required to give netizens peace in knowing that they could own a piece of the little red dot. Many jumped on the band wagon to create wealth. Flipping of properties was rampant and many bought it with the view to obtain rental. I should have been suspicious when my arch rival decided to dump a property into my lap. I remembered I was recovering in hospital and I was made to sign documents for a piece of property on the understanding that I would be supported. Well, the support left as quickly after I signed off on the paperwork. I concluded on the transaction, dutifully paid the transaction fees and other continuing mortgage payments, including recurring costs. Month on month the taxes that came with the property was dutifully paid. Rent came in but it was used to finance the repayments in part and the other was in cash. Quietly I paid without a word. But my ears were constantly reminded who is the real owner. Not me! But the one who forced me to sign the papers. Each time I am reminded to return the down payment paid. No one bothered about the recurring financing costs and other incidentals that came with the property. The claimant of this property failed to understand that constant fixed payments are part of cost. To this payer, it was not a cost but an “investment”. The offer of support never materialised when the property became vacant in view of the lack of incoming foreigners and an abundance of properties available in the market as supply outstripped demand. The payer of this property was too stubborn and ignorant to understand the change in economic trends and the potential threat of bank foreclosure if constant recurring payments are not met and this payee has no financial means to pay on behest of the bank’s request to top up. Perhaps I studied too much. Perhaps I majored in economics to see the truth in how the market can pan out. Offer of assistance is always on the lips but not action. In a property downturn, the sale of the property will incur heavier losses, plus the hefty stamp duties meted out by the relevant authorities to prevent flipping. Hence, how do I begin to forgive? Will I be forgiven by this payer as he seems to think I am being difficult. My loss is my problem. Just so long as payer recovers his capital seeding sum. So, if I sell and a loss is incurred, I would still need to pay in full the capital seeding sum. Did I ask for this burden? No, I do not remember being asked. I was a useful tool to use. Which brings me back to the meaning of life. What is the meaning of life? It is about struggling and constantly running on the hamster wheel and yet living to meet the expectations of others. Along the way, I would still have to accept the difficulties of life and its challenges or problems, hold head up high and smile as if the world is still endowing me with blessings. So much for religion. No God can help as hey, there are tonnes of others out there who would be in the same quandary. So, the prayee would also need to take a queue number to seek a hearing from any God. As for forgiveness – the people who made my life difficult has not once uttered an apology for what they threw at me. Still, I carry it in stride to provide the best for them. Do family members have to apologise to me? It would be nice if my siblings ever told me “sorry for the hard times we gave you that forced you to get out of the house”- no one did. It was much easier for them to pretend it never happened and for me to “forget” about it. So, no amount of quotable quotes I read can ever diminish the pain, hurt and stress that I have gone through all these years and possibly still going through. Sanity is a fine line between insanity and sanity. Once this fine line breaks, then perhaps, eternal happiness can exist. Is there meaning in life? This is a perennial question that oft gets no answers. Most times, I feel like a hamster running ceaselessly on my little wheel. True, many would say – go out and do something meaningful. Well, I did. I volunteered at organisations and still am an active volunteer. But even volunteers are not truly altruistic as many seek a favour in return – for e.g. getting priority entry into schools for their children or the chase of an award of sorts. I could hear a parent anxiously mouthing the need to volunteer for the sake of a foothold into a particular school. Wherein lies the true value of voluntary work. Another advice then rings out – get active in a church activity! Hmm, I was born a catholic (Catholics call people like us “cradle Catholics”), was truly pious (tongue in cheek I would say, I practically kneeled and prayed at churches so often that I must have scored brownie points with God and his entourage of saints) before becoming a lapse Catholic and now totally “bo chap” Catholic! So much for prayers! Sigh. it is either you have an unending trust in blind faith or you pick self up and get on with life. That is, you have got to bail yourself out of things – praying is not going to help you! I often bemoaned the poor branding of the Catholic brand. Comparatively speaking, the Church of St Alphonsus struggled with its fund-raising whilst another church of Christian faith with a younger leader, more hip and punk like, raised funds in an instance. So what is religion? Following a charismatic leader or blind faith? I am not one to be caught jumping up and down in a charismatic leadership style of prayer sessions. So much for motivational crap style of management theories. True, we all need to play a role at work, but I am one who is certainly not going to jump, scream and holler a war cry to break arrows or boards. If I wish to, there is this thing called, “martial arts” – I would be doing Karate, Hap ki do or Tae Kwon do. Bruce Lee would have been a better “God” for me to worship I suppose. By now, I hope readers would be breaking into a smile or a snicker or two! I was once told that I was a poor fit in a motivational boot camp at an MLM event. I brought negative vibes as I chose to sit stoically in my chair. The MLM ushers kept coming up to me to say to stand up and clap, scream etc. Brutal – but I ain’t gonna do it! I listened to someone sharing with me his experience at an MLM event a.k.a boot camp. He signed up because he thought he could learn and see if this was something he could dabble with for extra funds. He was put through a sleep deprivation process and the lead “spiritualist” came on stage to perform the best heart-rending sob story of his rags to riches story and had tears rolling out of his eyes as he screamed his lungs out in an auditorium. Dramatics would work for some but not all. Thankfully, this intelligent participant saw through the farce and decide to quit the program. As for the dramatic performer, the last I heard, was no longer worshipped. He tried to create a Godlike persona that does not almost always meet with the tastes and preferences of learners. Failure is not a choice most times. But an option – the way I see it. The constant chase for money is unending. Question is, when is money ever enough? I have no answer really. If I did, I would have written a best seller and made a fortune selling my recipe of success and probably will be leading another “spiritual worship” creating a new cult of followers I suppose (tongue in cheek again). I do believe that failure is the mother of success – what this means is, “crikey – learn from your mistakes and do not repeat it” – it does not mean that we “failures” can then get on stage and dramatize it, unless we can make a business from it. Capital asset would be saliva and manpower time. Low stock holding and you get paid instantly and in advance. Great business models for dramatic motivational speakers. By now, you will know that I am skceptical of motivational speakers. Do not get me wrong! I do read great business philosophy but in the privacy of my own space. I would love to listen to great statesman, especially Mr Lee Kuan Yew. His style suits me best. He is quiet with a huge ego and he has no space nor time for hoopla! He buckles down to get the job done! My hero! Back to my question on meaning of life – is it about money? Is it about fame? Is it about being a good child; a filial one? A good spouse or parent? A religious or pious person? Despite my 18 years of studying and earning two degrees before stopping after the mentally below average (MBA) stage and forgetting the process of getting my head permanently damaged “P hd = Permanent Head Damage” – I found no answer. I am unfortunately not enlightened at all! Perhaps life is about conscience. it is about living up to your own levels of conscience. Harm and do not harm – Geez, businessmen tend to kill competition and wheel and deal most times. If they chose this mantra, the billionaires would not exist. Look at George Soros, he manipulated the US dollar and made his wealth from it and he is on to his next wife! Life is good if you are a great businessman. So, is every businessman evil? Not really as we would need their expertise, else great people like Steve Jobs, Bill Gates and the likes others would not have existed. As to how they do business, this is part and parcel of life I suppose in this dog eat dog world. So, what is the true meaning of life? I admit, I am clueless as happiness is transient and is not long sustaining. Little things can make one happy but for that second as the happiness index does not last. Heck, in my company the CEO said he is not in the business of making people happy at work! So much for life’s meanings…………. Avid Gardeners would often tell me that they have green fingers or thumbs. I looked earnestly at their hands, they all looked beige pink like skin would be on inside of palms and brown skin, freckled but like Asian skin tones. Green was not a color I could see. This phrase of “green fingers” denotes one who plants anything and it thrives either in a pot or in a garden. I must confess that I do not like gardening much. I dislike the itchy skin I would get if I walk through lallang or grass. Yes, I do have sensitive skin and it breaks out when I do. But I admire greenery. I tried my hand at planting. Most shrubs like coleus or bamboo would die quite quickly after a while. But soon I found what my green thumbs and fingers could do – cacti or money plant. These take little effort and are extremely hardy. I would use organic fertiliser such as zoo poo to add onto the soil for my pot of cacti and as you can see, it is lusciously green and succulently green! Other than letting it fend for itself, it does not need my care. My money plant does well too. Happily creeping out of my pot, exploring new terrain as its creepers climb. Lucile is my host mum in Eugene, Oregon. She is married to Allan Dean McKenzie my art history professor whom I took a class in ARH 205 in my first term as freshie in Winter. Lucile, by her own profession is a historian and writes for Willamette publications. I remember she used to teach at Lane Community College. She is a lovely host mum and practical. She does not mince words and is feisty. She taught me good American values. Not all things Americans are bad. Of course, their gun policy or drug policy is not great but there are good aspects of America. Not all are bad. She helped me see these through her eyes. I remember her baking terrific pies for each meal she hosts me on weekends. I was over for thanksgiving once and I sampled her lovely coconut and yam pies. Gorgeous treats that lasted 5 minutes on the lips but forever on the hips! 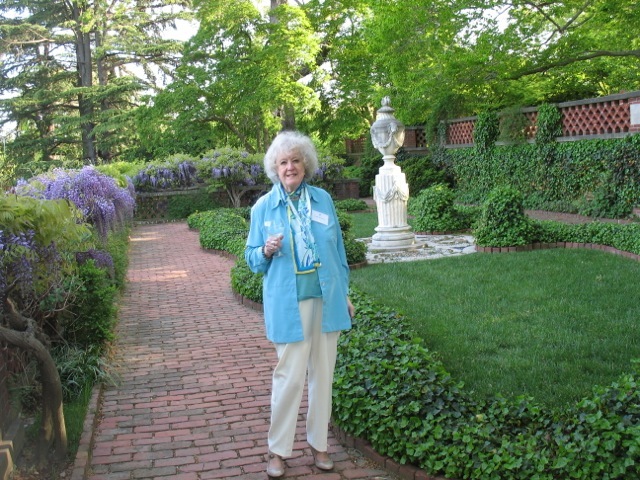 Lucile loves her garden and has transformed it into a heritage garden. Its guests includes deers, racoons, chipmunks and other critters. In summers, I use to enjoy sipping home made lemonade under the cool shade of a clump of bamboos, next to a stone sculpture of Buddha. Rhodedenrons in pink or purple hues would blossom in magnificent bunches to add colors to the greenery, amidst the bird houses that provide food and shelter for migrant birds. On another section of the garden stands a stone fountain which provides a watering hole for deers and critters wanting a frolic in the receptacle for a nice splosh. If I do not remember incorrectly, a little man made river runs through the garden adding the traquil sounds of running water through the quiet sway of bamboo fronds as the winds ripple through. The McKenzie garden is the hard work of both Lucile and Dean as every spring they spend their time in it, right through to Fall! Lucile is a strong principled lady and I admire her love for her children, grand children and great grandchildren. She lost a nephew through the Iran/Iraq war and she made it quite clear what she thought of the Bush administration. I can hear her voice saying “bunch of idiots” – she often wished she could borrow our statesmen to turn around their deficit. Singapore maybe a little red dot but hey this red dot is reknowned to great states like America and continents like Europe, Africa and Australia. Proud moments like these remind me that I am a useful Singaporean, not a parasite to society nor a leech to social giveaways. On the contrary I subsidise others through tax dollars and am proud to do so.